Courses intended for novices. These courses can either be face-to-face or e-learning courses. The format differs per course. The course length ranges from 1 to 5 days. The frequency varies, but the aim is to have these courses at least once a year. 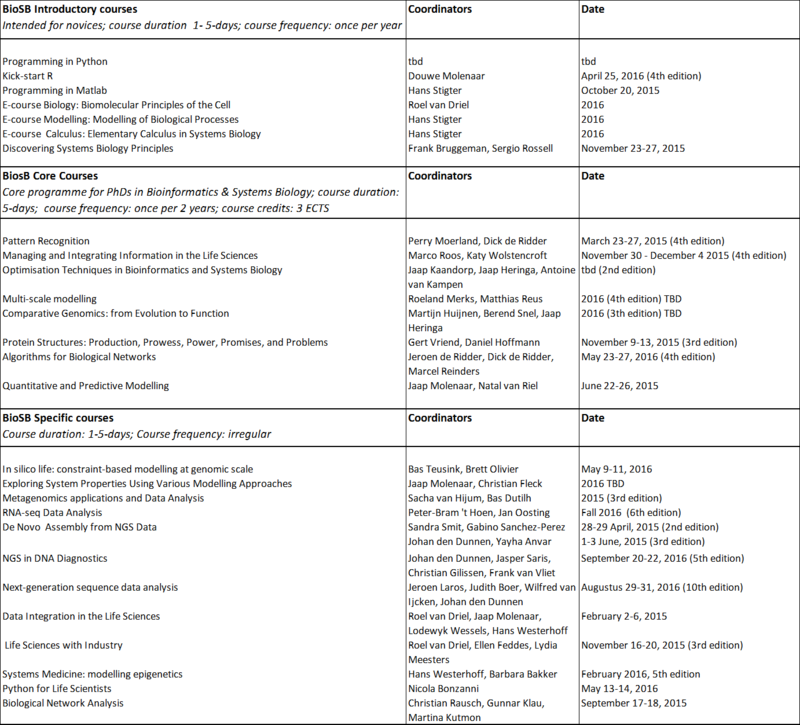 Courses for PhD students and other researchers in bioinformatics and systems biology. The topics and themes in the core programme form a coherent curriculum. The courses have a format of 5 days, with additional extra work (before and after ) with a total study load of 3 EC. These courses will be offered once per two years. Other courses and workshops that do not fit in the above-mentioned categories. These courses may have a different format and be offered occasionally only. E.g. summerschools. The BioSB education programme builds on the training programmes developed over the past years by the Netherlands Bioinformatics Centre, the Netherlands Consortium for Systems Biology, and their partners. The large group of tutors and staff that is already involved and the best practices that have been developed constitute a solid basis for the BioSB research school. BioSB intends to apply for KNAW accreditation in due time. The table in the course portfolio shows an overview of the BioSB Education Programme. For each course, information is given about the upcoming and earlier editions and for all courses it is possible to pre-register to indicate your interest for this course, after which you will get notified when the course is open for registration. Many of the courses shown are being organised by BioSB in collaboration with other organisations. Existing collaborations and/or partnerships with other research schools and graduate schools, such as ASCI, EPS, PE&RC, Molmed, MCISB, will be extended and new partnerships will be established.